When John Drewett's book thudded through my letter box it was already long-fabled; tantalising little snippets about its protracted genesis had been reaching my ears for nearly a decade. Now it has arrived - and at five and a half pounds weight and nearly six hundred pages, you certainly get your money's worth. In assembling this book, the author has left no stone unturned in his search for information about his subject, and every reel is there, from the mighty Zane Grey to the humblest Nottingham starback. The illustrations are wonderfully crisp, the descriptions comprehensive, and as a bonus, the appendices list the production dates for every reel. Add to this short biographies of the men behind the reels, and not just the Hardy family, but their employees as well, and you have a great book. The only criticism I have, and it is a minor one, is that the text is set in an unusually large font. It should also be pointed out that - as the title makes clear - none of Hardy's post-war reels are covered. This is a classic work which serves as the bible for collectors everywhere - the first edition is still available despite being published well over ten years ago. 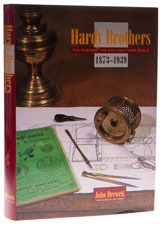 If the price is outside your range, or you want a primer on Hardy reels, try David Stanley's The Hardy Book of the Reel.